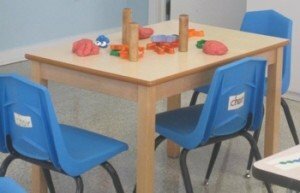 Do you want to strengthen your child’s fine motor skills? One of the best and easiest ways to strengthen the small muscles in their hands is to let them play with PLAYDOUGH! 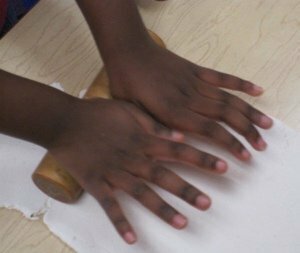 During free play and center times, our students can roll, poke, cut, and create with it. They can use rolling pins, cookie cutters, and pipe cleaners to change the dough or mix two colors together to make new colors. Worried about a mess at home? Line a cookie sheet with tinfoil and let your child play with the dough at the kitchen table. Mix all ingredients together. Cook on stove over medium heat. Stir constantly until mixture becomes a ball. Remove from heat, knead. Store in air-tight container. Mix ingredients. Cook and stir on low heat for 3 minutes or until it forms a ball. Cool completely before storing in a sealable bag/container.